Wilson Mericle and Cara Evanson ready for live closing music. It’s 4:45 pm on the day before Fall Break. The frantic pace of the preceding week has slowed and most students have already left campus. In the library, the former flurry of activity is now only evident in the crinkled papers and empty coffee cups strewn on tables. Computer screens are dark and the hum of the printers has grown silent. A new, unanticipated sound begins to drift through the air and past the ears of the few students who still remain, signaling the library is closing in 15 minutes. Today, it’s a baritone rendition of Autumn Leaves with viola accompaniment. Those studying in the basement may not realize it, but this music is being performed live. 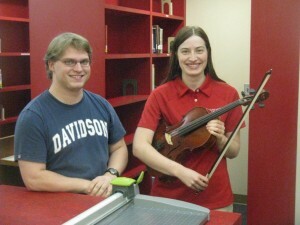 The history of the library’s closing music originated at a senior dinner hosted by former Davidson president Tom Ross. A student expressed his annoyance at the library’s closing buzzer, and asked that it be replaced by something more pleasant. The buzzer, installed when the library was built in 1974, rang at 15, 10, and 5, and 0 minutes before closing, with an especially long buzz the fourth and final time. President Ross took the student’s request to heart and asked the library to, quite literally, change its tune. Due to the wiring of the electrical system, options for song installation were limited. A European police siren and The Yellow Rose of Texas were discarded in favor of Ode to Joy. This slightly-mechanical version of Beethoven’s famous melody has continued to accompany the closing of the library ever since, rung at the same time and in the same intervals as the original buzzer. Closing music in action. Trish Johnson holds the microphone. 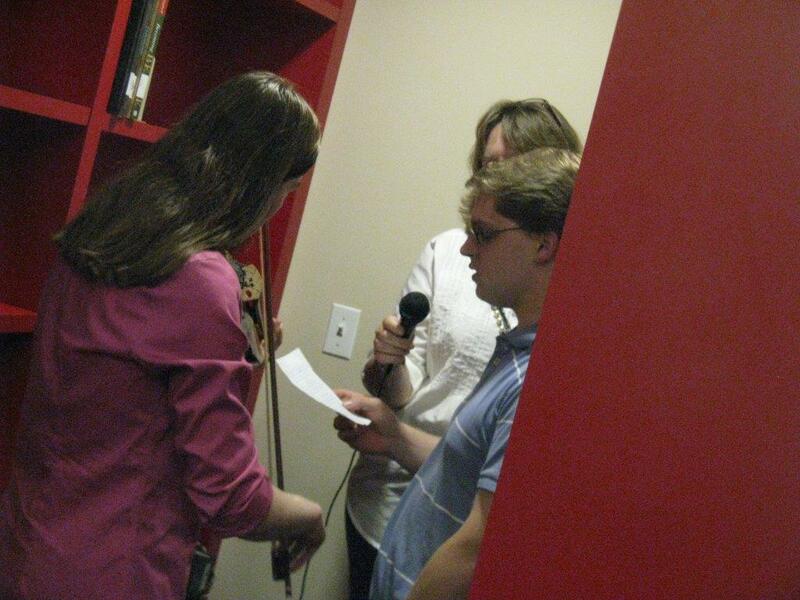 A key element in the further progression of the library’s closing music was the microphone installed behind the Information Desk when the first floor of the library was renovated in 2011. The microphone enables the library staff to make announcements to all three floors at the same time. While invaluable in emergency situations, the microphone can also be used to transmit live music, temporarily replacing the familiar tones of Ode to Joy. When the library closes at 5 pm, as it did before Fall Break, library staff can be found behind the Information Desk on the main floor performing live at the end of the work day. Selections so far have been mainly seasonal, such as Autumn Leaves, but live music is also used as a sendoff for departing library staff and a welcome for new ones. The library’s newest employee received a personalized version of “Hello, Dolly!” on her first day. 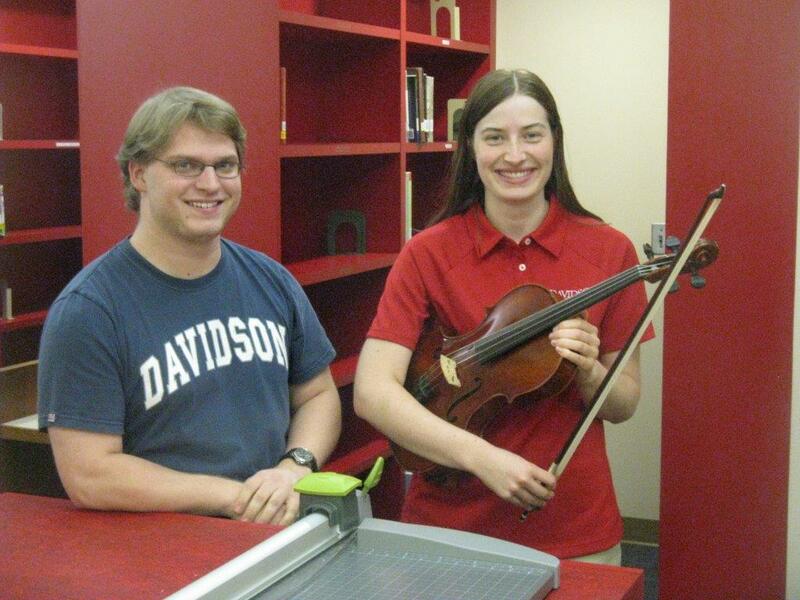 Interested in hearing live closing music at the library? Thanksgiving Break is fast approaching, so your next opportunity is 4:45 pm on November 26th! Photos taken by professor emeritus Dr. Gill Holland.